Welcome! 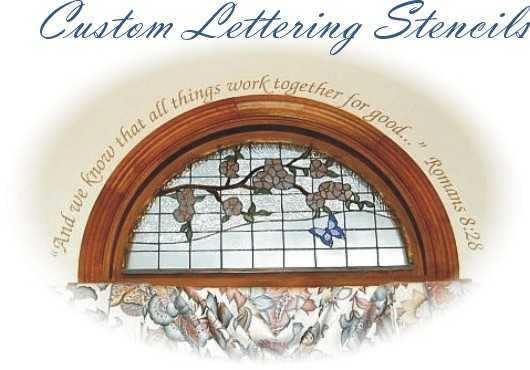 We are proud to offer this service after receiving so many customer requests for custom lettering stencils. See? Your requests really do matter! Our custom lettering stencils are one-time use or re-usable. Our simple method allows even beginners to produce stunning and professional results...without the custom price! Our step by step instructions, will show you how simple it is to stencil your own custom lettering. We have 16 fonts to choose from, providing many choices for all of your lettering projects. Our instant pricing lets you know the price of your stencil immediately. That's right! You don't have to wait days for a price quote. If you have any questions, please feel free to email us. We are here to help you and serve you! Thank you and God bless you for visiting us! Wall to Wall Stencils cannot produce Custom Lettering Stencils that include copyrighted or trademarked materials. Please do not request any Custom Lettering Stencils which contain such materials.